Happy 15th birthday, Netscape Navigator! Netscape, one of the most influential names in the history of the web, is 15 today. Its layout capability and image features kick-started the web design industry. Before its release, the web was a very grey place indeed. There were other graphical browsers before Netscape, but none so easy to use. 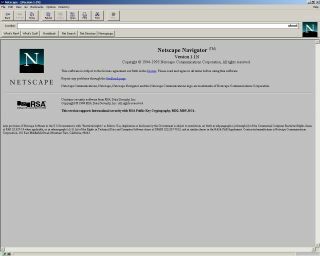 NCSA Mosaic, a federally funded project based at the University of Illinois, shared many of Netscape Navigator's interface features. That's because many of the team working on that browser - including co-author Marc Andreesen - jumped ship to form a commercial company. The result of their labours was Netscape Navigator, a browser so far ahead of the competition that it replaced Mosaic in the market while still in beta, with an 80 per cent share by 1996. Where was Microsoft during this time? Pretty much nowhere. The first version of Internet Explorer debuted a full year after Navigator. Built on code bought from NCSA Mosaic - Microsoft committed a dev team of six to the project. Netscape barely shrugged, shedding just 8 per cent of its share to Microsoft. The Netscape team liked to rub their rival's noses in those numbers. Arriving at work one morning to find an Internet Explorer "e" the size of a Buick planted in their carefully cultivated front lawn, the Netscape programmers took revenge in kind. They replaced the Explorer symbol with a six foot facsimile of dinosaur mascot Mozilla, complete with a sign boasting their superior stats: "Netscape 72, Microsoft 18". That arrogance would be Netscape's downfall. Netscape had nothing to counter it. Within 12 months, Microsoft went from underdog to market leader. The company's demise was hastened by a series of political decisions that must have looked good on paper. America Online bought the company at the end of 1998, in a stock-swap valued at $4.2 billion dollars. Despite this, AOL continued to use Internet Explorer as the browser for its ISP customers - missing a plum chance to revive the brand. Instead, they relaunched netscape.com as a web directory, then as a Digg-style news site. Attempts to update the browser came too late and lacked the flair marking Netscape's early incarnation. AOL formally discontinued browser support in February 2008. The Netscape web address now points to a version of AOL's portal page. But, Netscape lives on. The last savvy thing the company did, back in February 1998, was to open up the source code of their browser suite, setting up the Mozilla Foundation to oversee the project. Firefox, the browser built from Navigator's ashes, maintains its position as the world's second most popular browser, with a healthy 27% share of a crowded market. So, Happy 15th Birthday Netscape. Despite difficult times, it looks like you've many more ahead.